Crawl into comfort night after night with our Microfiber dorm sheets! Available in a variety of colors to mix and match with your Twin XL College Comforter for unique dorm room decor! DormCo offers Microfiber dorm sheets in Supersoft and Ultrasoft options for softer than cotton comfort. Take a look around at our incredibly soft and comfortable Microfiber dorm sheets at our great cheap dorm bedding prices! Our Microfiber dorm sheets will provide you with incredibly soft comfort that will be relaxing after a long day of college courses. 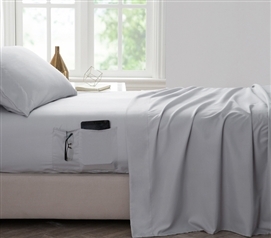 These Bedside Pocket Twin XL Sheet Set - Supersoft Pewter make a unique and useful dorm gift for new college students. These Bedside Pocket Twin XL Sheet Set - Supersoft Ocean Depths Teal make a unique and useful dorm gift for new college students. These Bedside Pocket Twin XL Sheet Set - Supersoft Gray make a unique and useful dorm gift for new college students. These Bedside Pocket Twin XL Sheet Set - Supersoft Jet Stream make a unique and useful dorm gift for new college students. 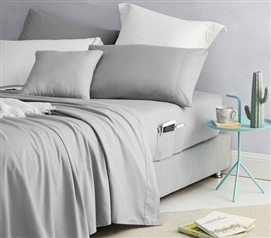 These Bedside Pocket Twin XL Sheet Set - Supersoft Glacier Gray make a unique and useful dorm gift for new college students. 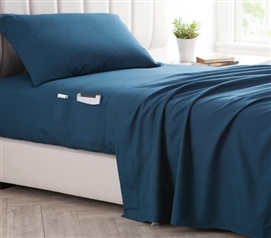 These Bedside Pocket Twin XL Sheet Set - Supersoft Pacific Blue make a unique and useful dorm gift for new college students. 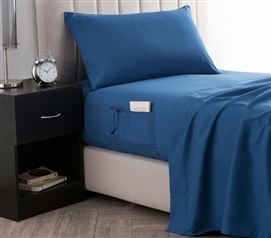 These Bedside Pocket Twin XL Sheet Set - Supersoft Nightfall Navy make a unique and useful dorm gift for new college students. These Bedside Pocket Twin XL Sheet Set - Supersoft Alloy make a unique and useful dorm gift for new college students. Don't overlook Twin XL Sheets on your dorm essentials checklist. You need more than a Twin XL Comforter for your college dorm bed, you also need Twin XL Sheets so you don't get short sheeted. Our Microfiber Twin XL Sheets are incredibly soft and comfortable so you will always have a quality night's sleep and the style you want for awesome dorm room decor. Don't forget extra sets of dorm sheets while you are dorm room shopping! It is a good idea to have extra XL Twin Sheets on hand in case you can't do laundry immediately.